Back cover blurb: 'If she could reach back through the years and warn the person she once was, what would she say? ... What would she say to the ghosts who now inhabit her days? So many of those she has loved are now nothing but dust and memory.' At twenty-six, Lillian feels trapped by life. Her marriage to Charles Oberon has not turned out the way she expected it would. To her it seems she is just another object captured within the walls of Cloudesley, her husband's beautiful manor house tucked away high in the Chiltern Hills. But, with a young step-son and a sister to care for, Lillian accepts there is no way out for her. Then Charles makes an arrangement with an enigmatic artist visiting their home and his presence will unbalance everything she thought she knew and understood. Maggie Oberon ran from the hurt and resentment she caused. Half a world away, in Australia, it was easier to forget, to pretend she didn't care. But when her elderly grandmother, Lillian, falls ill she must head back to Cloudesley. Forced to face her past, Maggie fights to hold herself and her family's legacy together as she learns that all she thought was real, all that she held so close, was never as it seemed. Two summers, decades apart. Two women whose lives are forever entwined. And a house that holds the dark secrets that could free them both. Hannah Richell’s books hold a special place in my heart, as her second novel, The Shadow Year was one of the first ever reviews I wrote on my blog. 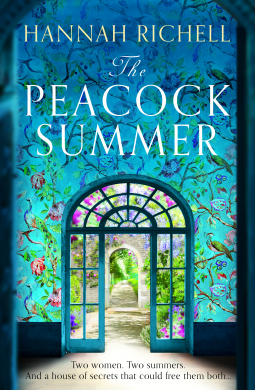 There is something magical about Hannah's books, and The Peacock Summer is no exception. It is a stunning novel, both visually and literally. Lillian Oberon is the lady of the 'Manor', Cloudesley. Wealthy and successful Charles Oberon's second wife, Lillian is young and beautiful, and already trapped into an unhappy marriage that she does not know how to get out of. Decades later, Maggie Oberon is in Australia, denying all knowledge of the problems she caused back in Cloud Green. Blissfully unaware that her grandmother is ill she continues her hedonistic lifestyle until one phone call changes everything. Maggie returns to the U.K. to find Lillian in a state of enormous confusion, and for the first time ever, she begins to question her family history. As her Grandmother begs to return to Cloudseley, Maggie’s intrigue grows stronger. But is she ready to face the truth about her family that has been hidden for so long. And she ready to face the truth about herself? The Peacock Summer is a beautifully written novel full of family mystery and intrigue, and one that will stay with me for a long time. The Peacock Summer is available now via Amazon online and all good book shops.